If you send or receive Christmas cards from Paducah, there will be one noticeable absence this year: the Paducah postmark. There is a loss of 24 hours in delivery time due to the closing of the Paducah processing facility. More than that, there is a loss of identity, a loss of independence. The postmark, which dates back to the 1600s and appeared in the United States as early as the Pony Express, shows the date and origin processing facility. It was used to prevent delays by mail carriers. The stamp cancellation mark, once separate from the postmark, was combined with the postmark as a time saving measure at processing facilities. The loss is difficult to measure. The mark is simply a tool with no monetary value. Most of the envelopes bearing the Paducah stamp have, over the years, ended up in the trash. But there are those special pieces of mail; letters and cards from family and friends, bearing news, greetings, and love. Have you discovered an old letter or postcard penned by an ancestor? Invariably, one of the first things we glance at is the postmark. It sets the stage, giving us a sense of place and time. The loss of the postmark is a symptom of the changing tide in communication and the postal service's struggle to adapt. By the mid-2000s, the rise of email had already decreased the amount of mail traversing our nation. In the decade since, the number of Christmas cards sent declined an additional 30%. Call it nostalgic, but nothing beats receiving a real, paper letter or card in the mail, especially at Christmastime. There is a sense of joy in opening the mailbox and finding a greeting from a loved one. It speaks of one's care in taking the time to select a card, inscribe a greeting, and prepare it for its journey. For those of us who love to send cards, it offers us a longer pause; a chance to reflect on the ones we love as we engage in the process. Therein lies the beauty of mail. Sure, it offers a physical tangibility that we cannot find in email and social media greetings. But it also gives us a chance to pause and contemplate the importance of people and relationships. Even though our cards this season will not be stamped with a Paducah postmark, we encourage you to still take the time to send Christmas greetings to those you love. There will be beauty in the receiving and much more beauty in the sending. 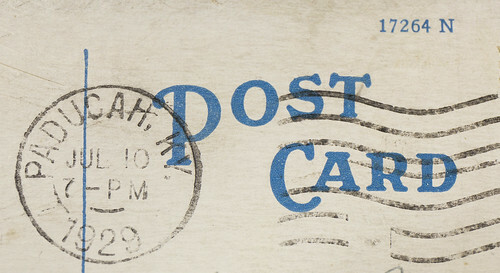 Did you know there is a way to return the Paducah postmark to your cards and letters? By obtaining a Mailer's Postmark Permit, you can make your own mark and keep Paducah on the mailing map! Visit the Mailer's Postmark Permit Club website to learn more!